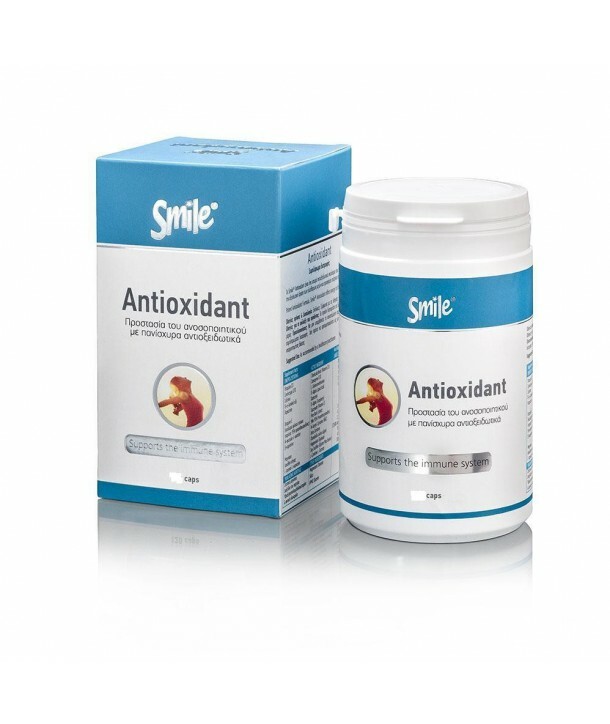 SMILE Antioxidant is a powerful antioxidant dietary supplement. His action is due both to individual components and the synergy of its ingredients. Its smart design and strong antioxidant activity, allows its use to all those cases with increased free radicals. SMILE Antioxidant will help maintain or even improve levels of health, energy and wellness. Athletes need a strong antioxidant protection to reduce oxidative stress as a result of intense activity. To protect muscles from intense stress and to achieve high performance. It helps to quickly remove toxins and protect the organs from the damage they cause. Surely, it is best to stop smoking, but those who insist on smoking will benefit from SMILE Antioxidant. People that their body is flooded with toxic substances during their work (e.g. chemical industry, printing-work, etc.). Also all of us who live in big cities and eat non-organic products. Every day we face a multitude of toxic substances that our body has to neutralize. SMILE Antioxidant will help this process. SMILE Antioxidant gives quickly a more youthful and luminous skin. Helps people with chronic fatigue and decreased energy restore their health. Both Vitamin D, that is characterized as anti-aging, and the improvement of the cardiovascular function and the immune system as well as blood sugar control lead to anti-aging. Individuals with chronic liver problems will benefit, as SMILE Antioxidant activates the antioxidant system of the body and regenerate vitamins C and E.
Its powerful antioxidant action protects the blood vessels, reduces the oxidation of fats and also provides energy for the proper functioning of the heart muscle. It improves telangiectasia and removes bruises. Both help to control blood sugar and to prevent complications due to diabetes as it keeps the vessels in excellent condition. Its strong antioxidant effect will help those suffering from inflammation in the joints. These people have oxidative stress and SMILE Antioxidant reduces it. So you can resist more to the various virus and diseases where immune systems’ effect is crucial. It also helps those undergoing chemotherapy or radiation therapy to complete treatment by reducing the resulting side effects. Vitamin D3 is the only vitamin that is characterized as anti-aging and it acts rather as an hormone than a vitamin, affecting many body systems. During the summer that our body produces large quantities of D3 due to sun exposure, human health is at a higher level than in winter, based on statistics. Vitamin D regulates calcium and phosphorus levels in the blood by promoting their absorption from food and helping the reabsorption of calcium in the kidneys. It inhibits secretion of parathyroid hormone. Vitamin D affects the immune system enhancing phagocytosis, showing antitumor activity and immunomodulatory functions. Low levels of vitamin D lead to cancer (e.g. breast, colon) and elevated heart attack levels for men. In addition, lack of vitamin D plays a role in cases of stroke, hypertension, autoimmune diseases, diabetes, depression, osteoporosis, osteoarthritis, muscle weakness and periodontitis. These show the importance of Vitamin D and this is why it is included in SMILE Antioxidant. Coenzyme Q 10 is a benzoquinone acting like a vitamin. It is responsible for energy production in the body. In all human cells, food energy is converted into energy in the mitochondria by Q10. 95% of the energy that the body needs (in the form of ATP) is produced with the help of Q10. The organs with higher energy requirements (such as heart and liver) have the highest concentrations of Q10. Q10 is also beneficial for people who suffer from migraines. It also has an anticancer activity, but also offers powerful protection to the heart muscle against the side effects of chemotherapy. Q10 protects the brain from neuro-degenerative diseases such as Parkinson’s disease. It also protects the heart in case of arrest. It has an effect in hypertension by reducing both systolic and diastolic pressure. Studies show that it reduces oxidation and destruction of DNA’s double helix. Statins (drugs to lower cholesterol) reduce Q10 in the blood serum up to 40%, so Q10 is recommended to those who take these drugs. Studies show that Q10 helps the immune system and makes the body resist to certain infections and various forms of cancer. Its action and the protection that it exerts to the heart muscle is important and helps even patients. Q10 may help patients with AIDS. It is no coincidence that patients with heart problems, cancer or AIDS have a Q10 deficiency. Selenium is an essential trace element for animals and humans. L-Selenomethionine is a source of selenium (Se) absorbed by the body (as selenium is bonded to the amino acid methionine), releasing 50mg elemental selenium. Soil erosion on one side, reducing selenium in food, and contamination of food on the other (e.g. mercury), which causes the body to "spend" selenium in order to neutralize toxic substances, have increased nowadays the need for selenium intake. In addition, the industrialization of food destroys selenium increasing even more the needs. Selenium takes part in many reactions in the body resulting in having effect in many systems. Selenium has a powerful antioxidant effect as it is part of glutathione peroxidase, a powerful antioxidant factor in the body. Taking selenium reduces the risk for prostate cancer. It acts by protecting and other forms of cancers. Selenium improves asthma symptoms and may help in some cases of cardiomyopathy. Selenium helps in the elimination of toxic mercury (Hg) from the body (Mercury is the cause of many chronic degenerative diseases). It enhances fertility in men as it increases the sperm production and motility. Selenium due to its antioxidant action helps in inhibiting the oxidation of LDL. Its action is similar to that of insulin and plays a role in reducing the oxidative stress associated with diabetes, thus reducing complications such as neuropathy, pigmentosa and cataracts. Low Selenium is also associated with the onset of arthritis. The lipoid acid is a potent antioxidant that protects against the symptoms of vitamin C & E deficiency. It helps regenerate antioxidants such as glutathione, C and E, thus maintaining the antioxidant activity level within the cell. It also helps the entry of glucose into the cell, thereby playing an important role in diabetes. Studies in mice suggest that the use of lipoid acid and carnitine helps memory and slows the degradation of mitochondria. This can help patients with Parkinson's disease. Newer studies show the effect of lipoid acid in inhibiting the establishment of atherosclerosis, lower triglycerides, reduce inflammation of blood vessels and reduce body weight, a very important effect for cardiovascular problems. Lipoid acid, by restoring glutathione levels commensurate with those of young people, acting as an anti-inflammatory agent, promoting blood flow, activating the immune system, etc. manages to show anti-aging effect. In the animals which were given lipoid acid, not only they lived longer, but in a better way (as younger people). Lipoid acid inhibits the oxidative damage caused by copper and iron binding them. It inhibits factor NF-KB which is involved in the pathology of diabetes, atherosclerosis and cancer. Quercetin is a flavonoid and in particular one of the flavonols. It is found in apple bark and in red onions. It has a potent anti-inflammatory action due to the inhibition of the primary metabolic pathways of inflammation. For example, it inhibits histamine’s synthesis and secretion. In addition, it shows a strong antioxidant effect and has anti-cancer properties. It has beneficial effects in prostatitis, in heart diseases, cataracts, allergies, infections and respiratory problems like bronchitis and asthma. Because of its inflammatory activity, it reduces pain in such diseases as arthritis. Men with prostate problems will benefit from its use. It may help control cholesterol levels. Vitamin E in the form of D-Alpha Tocopheryl Succinate is 5 times more bioavailable than synthetic vitamin E. For Vitamin E there is a huge literature. It is antioxidant and fat-soluble, detoxifies the body from infections of the atmosphere and the environment. We take it only through the food (our body does not produce it). It strengthens the immune system, it has skin regenerating properties, prevents breakdown and the joining of saturated fatty acids with substances that can be harmful to the body. It helps cardiac function by making the heart muscle function with less oxygen, thereby increasing its resistance. It causes dilation of blood vessels, allowing a better blood flow to the heart. It strengthens capillaries and protects red blood cells from damage caused by poisons such as hydrogen peroxide. It is derived from the bark extract of a species of pine that grows near the shores of Pinus maritime. This extract was known 450 years ago when, by using it, some sailors who had scurvy were saved, as its strong antioxidant effect was increasing the efficiency of C and extended its life. It improves the circulatory and tissue repair. Its antioxidant activity is a multiple of vitamin C and vitamin E.
It constricts blood vessels and increases the flow through the action in NO (nitric oxide). NO serves in the body by destroying bacteria and cancer cells (through macrophages) and the transmission of signals in the brain. It helps in the treatment of allergies responding to antihistamines. It protects and strengthens the connective tissue. It helps skin’s elasticity by stabilizing collagen and elastin. Its antioxidant properties help subacute caused by atherosclerosis. NAC is a powerful antioxidant and cells detoxifier, plays an important role in the production of glutathione, a substance primarily used by the body for detoxification and elimination of free radicals. Once NAC enters the body, it is converted to glutathione. It helps remove toxic heavy metals from the body, such as lead and mercury, promoting health of the liver. It strengthens the immune system, transferring nutrients to lymphocytes and phagocytes. It strengthens cell membranes, promotes the muscle tissue building and maintains RNA & DNA. It breaks down mucus that is found in the lungs, helping in cases of chronic bronchitis and flu. It protects against bowel cancer people having polyps in the bowel. Vitamin E is an antioxidant and helps to strengthen vision, prevents night blindness, serves in many disorders of the eyes, strengthens the immune system and protects against respiratory infections. It promotes growth of bones and teeth and maintaining healthy hair, skin and mucous. In the form of Beta Carotene it does not create hypervitaminosis problems, since the body chooses, based on its needs, the amount to be converted into vitamin A.
Protects against cancer and heart disease, reduces progress of cataracts, protects the skin from sunburn, and helps arthritis, psoriasis and hypertension. Beta Carotene used in Smile Antioxidant comes from the alga Dunaliella Salina. Magnesium is the fourth most common metal in the body and is essential for good health. Approximately 50% of magnesium is found in bones, while the other half is scattered in the cells of the tissues and organs. 1% of magnesium is found in the blood and body which works hard to maintain this level stable. Magnesium participates in more than 300 biochemical reactions in the body. It helps maintain normal nerve and muscles function, keeps heart rhythm steady, helps immune system’s health and keeps bones strong. Magnesium helps regulate blood sugar levels, promotes normal blood pressure and is known to be involved in energy metabolism and synthesis of proteins. Constantly there is growing research on the role of magnesium in hypertension, cardiovascular system and diabetes. Lecithin is a phospholipid extracted from soya bean. It is produced by the liver if the diet is sufficient. It is a key component of cell membranes, since without it, the membranes become more tough and fragile. It protects cells from oxidation. It consists mainly of B vitamins, phosphoric acid, choline, inositol and linoleic acid. It is the fats emulsifier and thus helps the circulatory system. Choline is useful in the synthesis of acetylcholine (neurotransmitter). Carnitine helps increase performance and weight control. It is a coenzyme and is involved in the metabolism of fatty acids into mitochondria and in energy production. It helps in better functioning of the heart muscle. He has significant antioxidant activity. Carnitine promotes the use of glucose and protects oxidation, thus helping diabetes. Dose: As directed by physician.